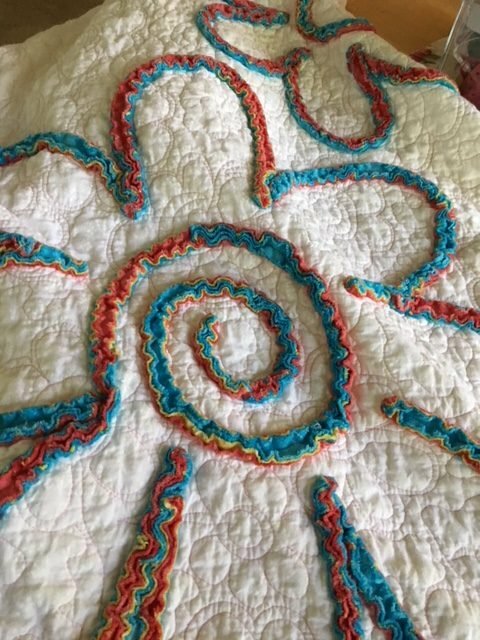 "Growing up I had two favorite blankets, grandma’s green and white chenille quilt and an overall quilted purple flowered blanket that my mom had. Both were used as bedspreads and they were yummy, cozy blankets. The perfect coziness for reading or taking a nap. Well, I thought it would be perfect to combine these two things into a wonderful lap quilt. This project was way out of the box for me and I really felt like I went out on a limb putting this quilt together. Let me tell you, I broke a few quilting rules and this project will feel like you are doing some steps out of order, but I promise it will all work out in the end. I promise! "I saw this project as a great opportunity to work on my free motion quilting. 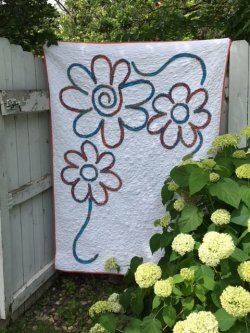 The base of this quilt is a quilted ‘wholecloth’ base that is embellished with chenille strips. It’s actually an easy technique. It took me a full weekend to complete it, but that included a few diet coke breaks."